This antique bicycle advertisement is red and rectangle shaped. 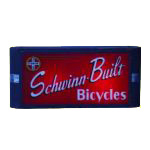 “Schwinn Built” is printed diagonally across the sign in white text, followed by the word “bicycles” in the lower right corner. The Schwinn logo is displayed in the upper right corner.